Mike Godsey wrote--- And last week we started working on a Nav. Aid based sensor location that will provide fantastic for sailors from TI, to the Olympic Circle to Pt. Isabel. Does anybody know what this is about and which buoy or buoys it will be on? By "starting working" on a sensor means we are just looking at the physical feasibility of a sensor on a given nav. aid and if the location is useful given the overall wind patterns. Once we have done that we begin the long unbelievably tedious process of convincing all relevant DOD departments and the CG that this location would provide vital information for the public and for their operations while also getting the local CG to support the location. Weatherflow has seen this process take from 6 months to several years. Assuming we get all the necessary approvals we then have to charter a suitable work boat than can work around rusty metal posts. And then schedule for the perfect day & time when there is no wind, no current and decent weather. Then see if our sensor crew is available to fly to the Bay Area to do the install. Obviously getting all of these variables aligned takes time. At present we are looking a several possible locations in the area you see in the image. The location has to be on a day marker since a buoy obviously would not work. 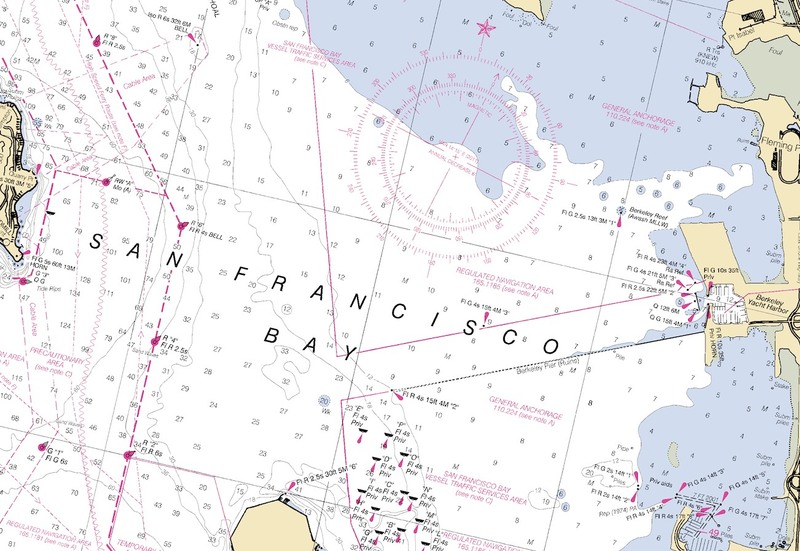 We would like a location that would provide information for the Treasure Island crew, the Bulb/Albany/Golden Gate Fields launch, Olympic Circle yachtsmen, ships in the S.F. 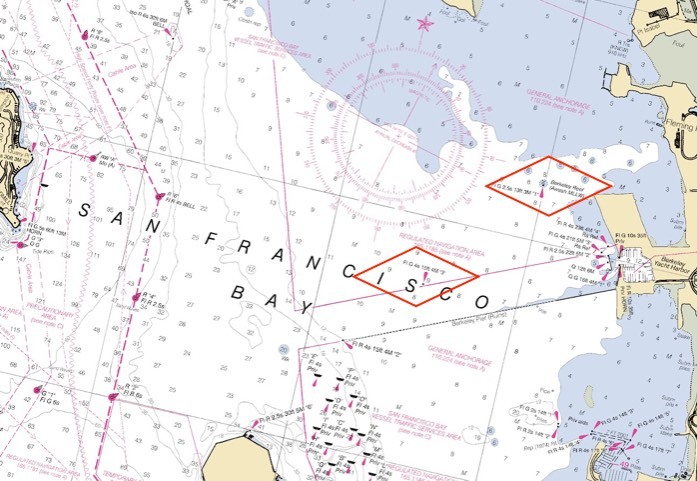 Vessel Traffic Services Area anchorage and most importantly CG Search and Rescue. We are especially interested in a site that will give an early warning of the change in the curving of the winds from more W to more SW that causes the abrupt fades and impacts Vessel Traffic Area and SAR missions. Let me know if you have any opinions about the perfect fixed Nav. Aid to meet the needs above. Posted: Mon Nov 27, 2017 8:27 pm Post subject: Old Berkeley Pier? Olympic Circle Pole "D" -- the fixed pole/mark shown near the "S" in Francisco on the chart you posted. "Berkeley Reef" Pole -- the fixed pole/mark shown on the (122 degrees) 20 minutes longitude line on the chart you posted, NW of Cesar Chavez Park and Berkeley Marina. Both these poles have platforms, cages, lights atop already --- and easily suitable for adding sensor(s). In addition to your listed interests and groups and locations, these recs (especially D almost equidistant b/w TI and East Bay shoreline) would also well serve Berkeley Yacht Club and racing community, CalCup racers, St. Francis Yacht Club and all windsurfing course racers and kiters as multiple long distance races travel east this far, and several times in the last few years required searches and pickups of dozens of kiters (particularly hard to see now with foil kites that will lay flat on water) and even windsurfers in the East Bay bubbles and abrupt fades. Right now we are considering both Berkeley Reff (right diamond in diagram below) and the Olympic Circle "D marker"
The reef marker should be better for catching the winds heading towards the Albany Bulb which will increase in popularity as it is developed. And would help Pt. Isabel to Shimada Park people with the winds more outside. The D marker would be more useful for racing, commercial and SAR purposes. It would also give you a heads up when the wind was curving more towards Pt. Isabel rather than Berkeley. Let me know if any of you have more thoughts.